Sealaska Heritage Institute (SHI) has prevailed in a decades-long effort to list the sacred X’unáxi (Indian Point) in Juneau in the National Register of Historic Places, making it the first traditional cultural property in Southeast Alaska to be placed on the register. The recent announcement by the National Park Service means that the federal government recognizes the roughly 78-acre site as an historic place worthy of protection under the National Historic Preservation Act. The Auk Tribe, the Alaska Native Brotherhood (ANB) and Alaska Native Sisterhood (ANS), Sealaska Heritage Institute, Sealaska, the Central Council of Tlingit and Haida, the Douglas Indian Association and other members of the Alaska Native community have fended off proposed development of the area also known as Auke Cape for more than fifty years, said SHI President Rosita Worl. “Indian Point is as important to Native people as Plymouth Rock, Abraham Lincoln’s log cabin and the Statue of Liberty are to Westerners. For nearly sixty years Native people have fought to protect Indian Point, and at long last the federal government has recognized that this area is sacred and is worthy of protection,” said Worl. “After all these years, we are extremely happy that the government has finally recognized that this site is a sacred site to us and its sacredness must be protected,” said Auk Clan Leader Rosa Miller. The listing was supported by the three landowners—the City and Borough of Juneau, the National Park Service and the Bureau of Land Management—as well as local and regional tribes and the State Historic Preservation Office. The area is the original habitation site of the Auk Kwáan in the Juneau area. The Yaxtetaan clan moved from Young Bay, ultimately landing at X’unáxi (Indian Point) about 500 years ago, according to genealogical reckoning. They erected the first Dipper House at Indian Cove/Indian Point and lived prosperously for some time; eventually the village moved to the adjoining bay about a mile to the north where the name Aanchgaltsóow (Town that Moved) was applied to the new settlement. The historic site was a lookout, refuge and meeting place and is the site of significant events in Auk history, including battles and encounters with other groups in which key Yaxtetaan leaders earned their titles and through which the clan established its status as owners of Auke Bay and the surrounding territory. In one story that has been passed down, the Auk leader (Kuwudakaa) challenges and ultimately defeats his Yakutat rival in a display of wealth—thus earning the name Yeeskanaalx (Newly Rich Man). This event has been memorialized in a name or title, a song and a story that are considered to be clan at.oówu (heritage property). The area is considered by the Tlingit to be the locale of Native graves and of shamans’ graves in particular. Shamans’ graves constitute particularly powerful landscapes that extend some distance beyond the actual burial sites and are generally avoided out of respect for the power of the spirits that continue to dwell in their midst. X’unáxi also was a valued subsistence site for fishing and gathering activities and was most notable for its run of herring, which was a highly valued resource. The archeological evidence and oral testimony indicate use of the site from 800 years ago through the 1970s. Use continues today but at reduced levels since the herring run gave out (excerpted from written comments by Susan H. Marvin, US Forest Service Regional Heritage Program Leader and Chair of the CBJ Historic Resources Advisory Committee, 2005). Contention over the area began in 1959, when the National Park Service sought to acquire the western portion of Indian Point for use as an administrative headquarters. The local camps of the ANB and ANS and people from the Auk Kwáan objected to the proposed transfer, and their protests ultimately resulted in a provision guaranteeing that their customary use of herring camps located in Herring Cove would not be affected or impaired by the land reservation. In 1968, the state transferred the southern half of Indian Point to the city of Juneau, which proposed to subdivide the property for residential housing. Once again, the Native community mobilized in protest and asked the city to reclassify the area for public use to ensure their continued access to the area for harvesting herring eggs and other fish. It was the first political issue Worl fought after the ANS koogeina (sash) of her mother, Bessie Quinto, was transferred to her after Quinto’s death in the 1960s. “My mother was politically active in civil rights and salmon cannery unions seeking equal pay for Natives and improving working and living conditions. She taught me that Indian Point was an Auk sacred site,” said Worl, who at that time testified against the proposal, which was widely publicized by the Tundra Times. The issue arose again in 1992, when the National Oceanic and Atmospheric Administration (NOAA) and the National Marine Fisheries Service (NMFS) proposed to build a large facility at Indian Point, sparking a contentious battle that would last for six years. At one point, NOAA offered $1 million if the Native community would drop their opposition. The clan leader of the Auk, Rosa Miller, adamantly opposed the destruction and desecration of their sacred site and the Auk immediately rejected the offer. The Auk Indians were supported by the Native community, and Sealaska was prepared to go to court to defend the site. That battle ended in 1998, when the federal agencies selected a different location outside of Indian Point. Around that time, Dr. Tom Thornton, on behalf of NOAA, completed a report titled “Traditional Cultural Property Investigation for Auke Cap, Alaska,” which found the property was eligible for listing in the National Register. Sealaska Heritage first applied to list it in 2004, triggering a lengthy process through which all levels of government scrutinized the application, which was approved by the National Park Service in July. To qualify for the listing, SHI had to prove that the site meets at least one of the following criteria: A) is associated with events that have made a significant contribution to the broad patterns of our history; B) is associated with the lives of persons significant in our past; C) represents a significant and distinguishable entity whose components may lack individual distinction; or, D) yielded, or may be likely to yield, information important in prehistory or history. X’unáxi embodies all four criteria. A listing on the National Register encourages the preservation of National Register properties, said Worl. “It calls attention to the cultural and historical significance of the site. It provides a mechanism for SHI and other organizations, including the Auk clans, city and federally-recognized tribes to coordinate efforts to preserve its integrity as a cultural site, to support an appropriate approach to manage the area, and to protect it from adverse effects of development,” said Worl. The designation on the registry will not affect private property next to the site. Sealaska Heritage is consulting with the Auk Tlingit, who plan to host a ceremony at Indian Point to mark this historic event. 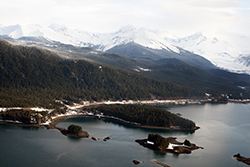 At the request of the Auk people, Sealaska Heritage will work with local Native groups, the CBJ, the National Park Service and the Bureau of Land Management to develop a management plan for the area to ensure its longer term preservation. Sealaska Heritage Institute is a private, nonprofit founded in 1980 to promote cultural diversity and cross-cultural understanding through public services and events. The institute is governed by a Board of Trustees and guided by a Council of Traditional Scholars. Its mission is to perpetuate and enhance Tlingit, Haida, and Tsimshian cultures of Southeast Alaska.